Some businesses face bigger, more complex security threats than others. They’re more likely to get sustained attention from the most sophisticated attackers. The more precious the data – whether it’s retail customers’ payment details or pharmaceutical companies’ intellectual property – the more urgent the need to protect it. And the more attractive the idea of completely joined up security becomes. With Assure Cyber we can bring together the mass of data from across your security systems and analyse it alongside other information. To do it, we’ve built our own big data platform that can work out immediately which systems might be under threat – a job that normally takes days. It weighs up the risk to the business from a would-be attack, which frees analysts to focus only on the ones they really need to, saving time. It also picks up anomalies that might otherwise slip through the cracks. It can look into unusual data transfers or login activity to see if the system is facing a persistent threat or if someone is abusing trust. The UK’s Ministry of Defence ICT infrastructure faces constant threats from sources including organised criminals, foreign intelligence services and disaffected staff. With different ICT systems in place, the MoD wanted to integrate its system security information sources to create a centralised security capacity and expand its situational awareness. We designed and deployed an off-the-shelf cyber-defence solution called Assure Cyber. It makes the MoD better at spotting potential vulnerabilities, and that means would-be attackers have less chance to exploit them. Along with other products and security information feeds, it’s made a real difference. “With Assure Cyber we can successfully complete work in less than 30 seconds that previously took around two weeks,” says a member of the MOD Information Systems and Services organisation. 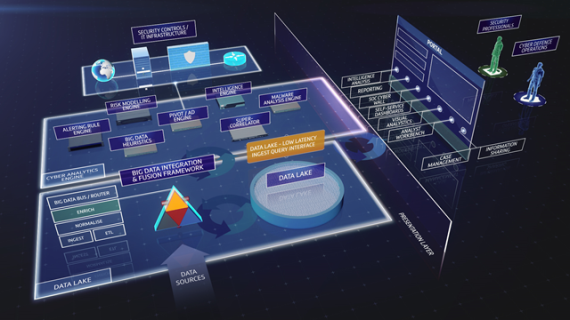 BT Assure Cyber brings together event data and telemetry from a rich variety of sources including business systems, traditional security controls and advanced detection tools. Vulnerabilities and incidents which would previously have taken days, even weeks, to investigate and respond to, can now be identified and acted on immediately. It uses a number of advanced analytics engines to detect subtle threats within the monitored environment. It then puts those threats into context within the vast array of events presented to cyber defence analysts and security professionals that would otherwise distract attention from priority incident analysis. At the core of the Assure Cyber architecture is a “super correlation” engine that uses advanced mathematics to pick out anomalies from within human and machine orientated traffic. This complements traditional anomaly detection methods to gain a heightened situational awareness beyond that achievable with a single method of detection and analysis. The platform uses a pro-active methodology informed by a unique risk modelling engine that puts complex and routine threats into context. It determines how serious a particular attack may be to an organisation, taking into consideration the multiple layers of defence between an attacker and the vulnerable asset subject to attack. BT Assure Cyber is currently available globally.